For most people, $800,000 is a life changing sum of money, a dream come true for anyone grinding out week after work of a job to ensure that they can keep a roof over their heads and put food on the table. However, in regards to the process of making a film, a production budget of under a million dollars these days is almost unheard of as we currently experience a cinematic landscape that regularly releases works with budgets north of 200 million dollars, needing absurd box office success in order to simply break even. The directorial debut of the new hot commodity in the industry Gareth Edwards, Monsters is a film of stunning craft and attention to detail, a film derived from passion that is oozing with nuance and a message of political thematic significance, and the fact that it came to be from a budget so low only makes it that much more astonishing. At the start of the film we are provided with a quick bit of background on what has lead to the existing circumstances of North America. Six years earlier, a NASA deep space probe crashed in northern Mexico, and the samples it had collected lead to the appearance of new life forms in the region. 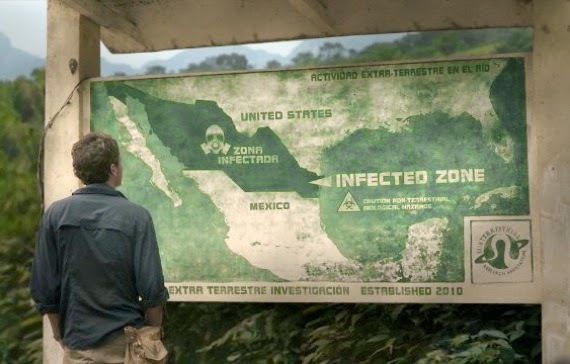 forcing a massive piece of land to be quarantined and labeled as "infected", a giant wall being erected to stop the creatures from entering the United States. With this information in hand the story begins, that of a photojournalist named Andrew Kaulder (Scoot McNairy) being contacted by his boss while on assignment in Mexico, giving him an entirely different task. His new job is to locate and protect the bosses daughter, a young woman by the name of Samantha (Whitney Able), whom is also down in Mexico and ensure her safe return to the states. This is a far greater challenge than a typical bit of travel, as the only safe passage without having to cross into the infected zone is by water, a ferry system that runs through the Gulf of Mexico, one that charges the incredibly pricey sum of $5000 a ticket, an amount that Kaulder is willing to and does pay to complete his mission, but when the moment arrives for Sam to board the ferry they come to the realization that her passport was robbed by a guest Andrew had spent the previous night with. 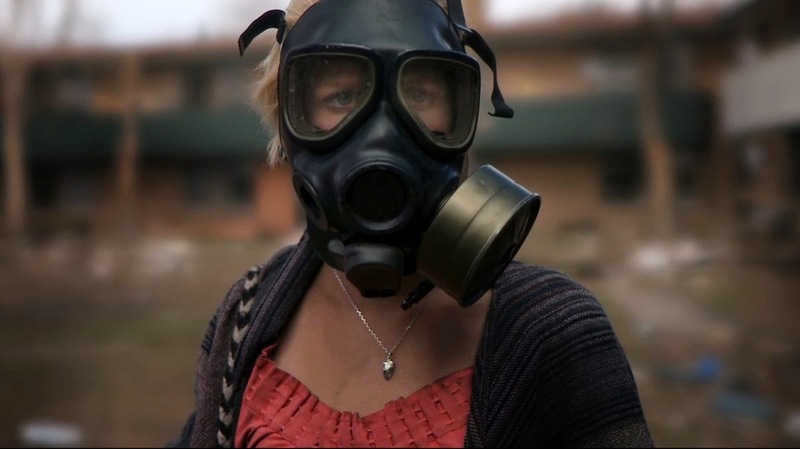 This leaves only one course of action to get back home to their lives and loved ones waiting for each of them respectively: travel directly through the infected zone by vehicle and on foot. There are more aspects to the story and the development of these two lead characters involving those that await their return and whether or not Sam truly wants to return to her normal life and feign happiness that clearly eludes her, and I admired the way Edwards valued creating a film that existed in a science fiction, supernatural world yet focused its narrative on a human level, a dose of realism and believability while surrounded by a landscape filled with a nightmarish threat that represented anything but. Andrew and Samantha feel genuine, their emotional connection and attraction proceeds at a pace that seems plausible, and they fact that they need each other in order to survive the ordeal allows their chemistry to resonate on a deeper level. I would compliment a script if possible, but in regards to Monsters one essentially did not exist. Due to financial constraints and the indie status of the project, Edwards was forced to shoot in various locations without even asking permission in advance, and every other character besides the two leads were merely people on location that were willing to participate as extras and were not asked to memorize a script but instead merely given a guideline on what should happen next and allowed to deliver it in any way they saw fit. When considering this, along with the fact that each day whatever content they had filmed had to be downloaded off of a flash drive to clear off the space to continue shooting the next day, what Edwards achieved here is truly remarkable. Not for a second was I bothered by an amateurish feel to the film, nor did I wish for anything more from the performances. I was hooked from the get go and cared deeply for the fate of these characters, I absorbed the clear political themes that were in play when a story involves a giant fence stopping "monsters" from Mexico from gaining access to the United States, and I admire any level of nuance involved in such a low budget debut feature. Also noteworthy are the special effects of the film, as the monsters rendered after filming had completed do not look low brow or cheap in any way, shape or form. The entire film is photographed with confidence and beauty, and during moments involved the alien creatures they were added to the backdrop without skipping a beat and fit right into the frames, work that became even more admirable once I learned that Edwards himself created all of the visual effects on his laptop using an Adobe software any person could purchase off the shelf of an electronic store. Truly remarkable, and such a passion for cinema and a personal vision is something that I easily embrace and leads to me thinking highly of the filmmaker going forward. Shortly after I watched Monsters for the first time, the announcement came through that after the success of his second film, the mega blockbuster Godzilla reboot, Gareth had been chosen by Disney to helm a spin off Star Wars film as his next project, I began to look for more information regarding further details as I am an enormous fan of the galaxy far, far away. While visiting various message boards and forums for film discussion, I came across multiple people who referred to Monsters as "truly terrible" and even in more than one comment it was described as "one of the worst films ever made". As I had just experienced this triumphant example of the power and possibilities of independent film-making, these reactions floored me and I couldn't wrap my head around such thoughts. I am a firm believer in the value of an opinion and allowing others to have their own without judgement, because what one work does to a person may not impact another in nearly the same way, but such outlandish hyperbole really troubles me from time to time. I see plenty of films that feature content that simply does not click with my interests, but I am still able to recognize the good that went into crafting the film, various bits of framing and imagery that I found impressive or a performance that stood above the rest. To dismiss Monsters as "one of the worst films ever made" means you either need to have your eyesight checked or simply do not watch nearly enough cinema, because so much good went into this production when those creating it were given so very little to work with. My reaction to Monsters is beyond mere admiration due to a low budget and the factor of it being a debut film for Edwards. On practically ever level I adored this film, and after sleeping on it the love continues to flourish. Super impressed by what he accomplished; really enjoyed this one. obviously, you and me both Brian. Amazing achievement given the limitations while making it. Now i Can't Wait to Watch This!! It is on Netflix streaming, if that option is available to you. Thanks for reading Tara!